Although already known for being easy to use, the Python programming language has gotten another boost in usability thanks to a new free graphical editor from development software provider JetBrains. JetBrains has split the latest edition of its PyCharm Python IDE (integrated development environment) into two editions, the paid professional edition and a new free community edition. JetBrains hopes that individuals who are new to Python, or who are learning to program with Python, could use the community edition of PyCharm. The community edition is also suited for coding lightweight applications and writing administrative scripts. The free edition of PyCharm comes with the typical functionality a developer would want from a modern IDE, including syntax highlighting, code completion, error recognition and code search. Those who use Python in production settings, and require advanced functionality, would find the professional edition of PyCharm more appropriate. 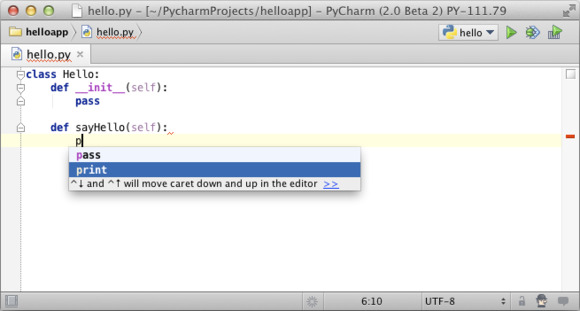 The professional version of PyCharm 3.0 includes new features such as a tool to detect duplicate code, the ability to run a local terminal within the IDE, improved recognition of Python code for code completion, as well as support for Python modules and frameworks such as SQLAlchemy, Pyramid, and Web2py. Developer Guido van Rossum released the first edition of Python in 1991 as alternative to low-level languages such as C or C++ that would be easier to use, and produce code that would be easier to read. An open source, general use dynamic language, Python has since grown to be widely used for building Web applications and scripting system administration tasks. When used with the Numpy library, Python is also becoming widely used in numerical data analysis. In its latest ranking of the world’s most popular programming languages, developer tools company Tiobe estimated Python to be the eighth most widely used overall. The professional edition of PyCharm 3.0 starts at $99 for individual developers. The community edition can be downloaded at no cost from the JetBrains site.